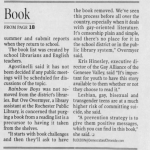 On March 12th, 2018, Sean sat down to interview Trish Warren, a Webster librarian who was closely involved in the Rainbow Boys case. The entire 20 minute interview transcript is found here, but below are some of the highlights from the interview that explain Trish’s stance on the challenge and other challenging material. Trish Warren has served as the Webster Thomas High School librarian for over twenty years, handling changing administrations and locations. and of course multiple incidents of challenged books. As Sean’s attached interview with Trish reveals, Trish takes a careful, case-by-case approach to deciding what material is accessible to her student population. She believes in offering books that have a “so what?” that the story’s outweighs gratuitous content. 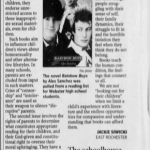 In other words, if a story holistically has the chance of expanding a student’s worldview, fostering empathy, or helping to build identity in a time of personal change, moments of questionable content can be forgiven. She uses this philosophy for handling challenges to the material she selects for the library, as detailed in her account of the meeting with the challengers of Rainbow Boys. 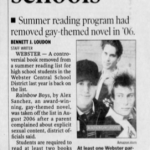 When asked about the appropriateness of a scene in the story in which two gay characters engage in sexual conduct (see “About Rainbow Boys“), Trish reminded the challenger, “Well sir, that’s out of context. You have to take the whole story and know what this boy was struggling through.” For Trish, no single moment defines a story in YA fiction; educators must think holistically to evaluate the worth of a book. Trish’s ideas are reflected in an attached document she gave Sean during their interview, District Regulation 5292 (5292 page 1 5292 page 2 5292 page 3 5292 page 4 5292 page 5). In that document’s “Criteria for Selection of Library Materials,” line item No. 5 states “Materials shall be selected for their strengths rather than rejected for their weaknesses,” while No. 10 similarly offers “Materials will not automatically be disqualified because they contain potentially controversial materials. 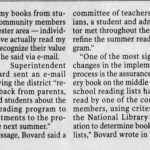 This decision will be made on the basis of whether materials realistically deal with life and life’s circumstances.” Embedded in the district policy, created by and for librarians is the idea that books are the sum of their parts; the experience they offer students comes from the collection of moments in the story. 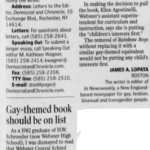 Thus, for section of 5292 referencing the challenging of material, the complainant must answer the question “Have you read the work in its entirety?” and also reminds complainants that “Access to challenged material will not be restricted during the review process.” With this clear policy in place, it is difficult to understand how Rainbow Boys was abruptly removed from the summer reading display in August 2006, yet when Reverend Morse called then-assistant superintendent Ellen Agostinelli she pulled the book from the shelf “before returning his call” noting “I thought he’d like that.” On this apparent oversight, Trish said Ms. Agostinelli simply did not know about policy 5292 and she would not have expected her to, demonstrating the complicated nature of varying interests a district’s response to a book challenge. One fascinating part of Trish’s story that adds context to her views on censorship is her handling of the challenge of The Perks of Being a Wallflower. 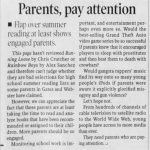 After reviewing the material upon its release and growing popularity, Trish concluded that the themes of the story did not outweigh its suggestive content for the high school level, but encouraged Webster’s public library to carry the book. 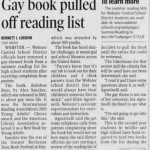 Upset, a student wrote to the American Library Association accusing Trish of censorship. In response, Trish simply stated “let’s face it- everything is judgement. There’s no rule. 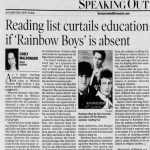 When I read it, I felt it was gratuitous.” Indeed, our librarians are tasked with making difficult but crucial judgement calls like those surrounding Rainbow Boys and The Perks of Being a Wallflower all the time, and Trish’s experiences make clear that censorship is not as easy as it is sometimes made out to be by groups that vehemently encourage the reading of banned material. Interviewing Trish, Sean felt a clear passion for the subject was present even after nearly 12 years had passed. 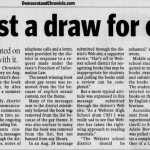 Trish grimly recalled the district informing her she was not allowed to be interviewed for Bennet London’s Democrat and Chronicle interview on the challenge, having had a lot to say then and a lot to say now when it comes to giving students stories that expand, shape, and create within realistic standards of appropriateness.